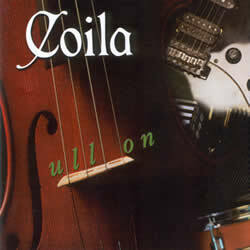 Recorded in 2001 on the Lochshore label (KRL records), ‘Full On’ is a cutting-edge selection of big-band celtic music. Some years ago at a very eventful ceilidh in the dance tent at Cambridge Folk Festival my Celtic-Rock band Collaboration had the pleasure of teaming up with Capercaillie. Unfortunately we never did record the event, but this recording by Coila brings the memories flooding back. There’s plenty of great material here from some of the finest contemporary/traditional tune writers including Liz Carroll, Donald Shaw and Michael McGoldrick. The band’s fiddle player Alistair McCulloch should also be added to this roster as his own contributions will surely find their way onto the session circuit. Coila rock along with the best and the other members William Weir (accordion), Andrew McGarva (synthesiser), James Taylor (drums) and Dave Cowan (bass guitar/guitar) all give it plenty of welly. The album is produced with plenty of momentum or subtlety where required and although it would have been nice to balance the recording with some vocal tracks the performances from everyone are to be admired. With so much instrumental Celtic music consisting of the same few types of tune, it’s hard to be distinctive without a stamp of individual personality. With a background of jazz and classical alongside traditional music, the young Ayrshire quintet Coila have some useful tools at their disposal. The vigour and close-knit empathy of their twin-fiddler frontline, their arrestingly layered arrangements and a healthy sprinkling of original material show the makings of a durable signature … it’s easy to tell they’d put on a cracking live show.